It’s finally tomato season in the South. The farmers markets are bursting with the colors of every heirloom tomato imaginable and your home garden is probably over flowing with tomatoes of all sorts. There is nothing like the season’s first BLT, the second BLT and third, until you’re still looking at a pile of tomatoes and suddenly not so interested in another boring BLT. Don’t get me wrong, there is nothing like a garden picked BLT where the star is some unknown heirloom exploding with its sweet acidic glory, but what if I could add some texture? 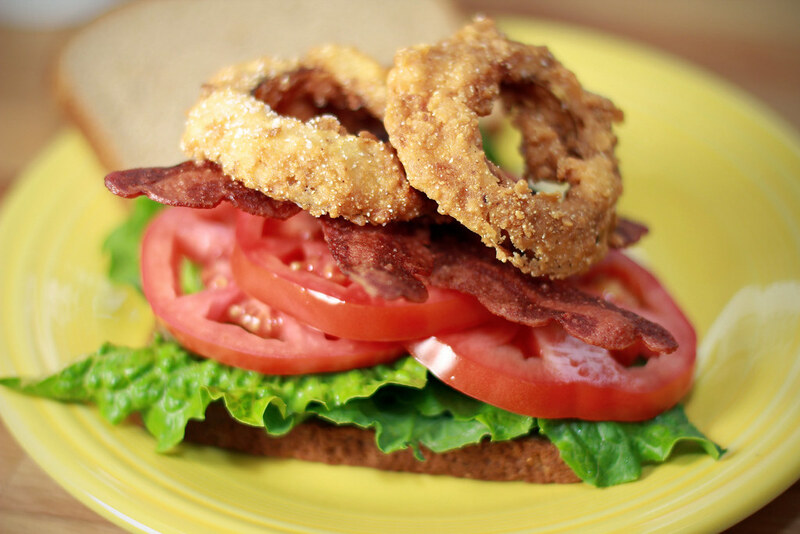 I give you my Southern food twist on the classic BLT – the “BLORT” Bacon Lettuce Onion Ring & Tomato Sandwich. I know it sounds crazy to do anything to a BLT that might some how alter the flavor of those beautiful tomatoes, but this is my blog and I’ll fry if I want to. What is more Southern than bacon and fried onion rings? I have a passion for onion rings ( and calamari but that’s another blog) so I order them everywhere, keeping a mental record of the best rings on earth. The idea hit me while dining out, to add my onion ring to my BLT and boom, magic. That boom was a near burnt onion ring I almost sent back had it not been for my culinary curiosity. This greasy spoon restaurant was a little to liberal with the spicy seasonings on their rings, which with out it would have prevented me from ever creating my masterpiece. For this recipe to really work it takes a special onion ring, with a very particular texture, otherwise you’ll have a soggy sandwich with a greasy onion ring on it covering up the flavor of your prized tomato. 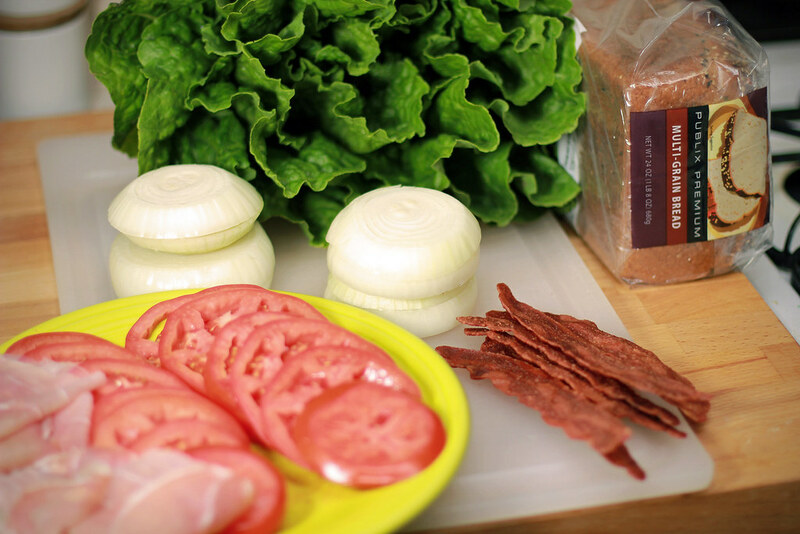 A BLT isn’t rocket science, if you know the acronym you understand the recipe. What I really want to make clear is the peculiar Onion Ring you’ll need to create. You’re going for a ring that is full of fried heat, directly from Tobasco sauce, crispy in texture and with a flavor that screams somone walked away from the fryer. 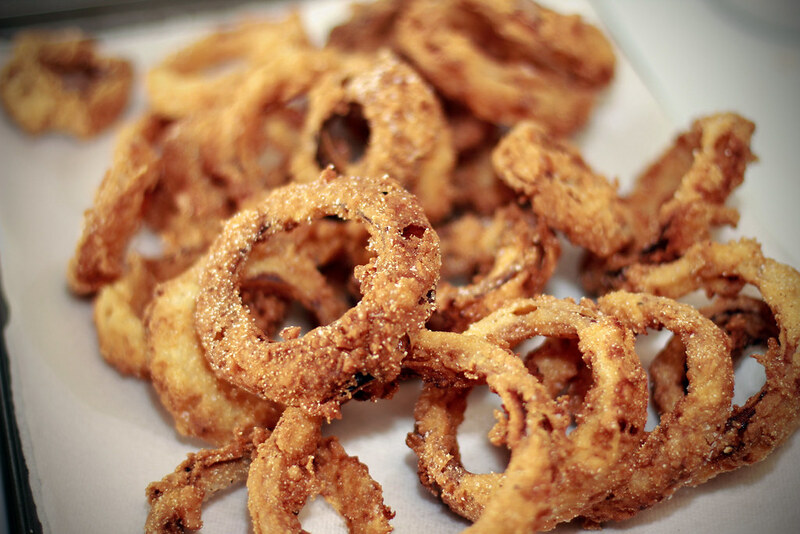 It’s almost a “Good For Nothing” onion ring, that is way too crunchy, salty, smokey and insulting, but perfect for just this recipe. Slap that ring down on top of your BLT and it will take on a new dimension, with a crisp smokey bite from this happy accident (sneak a slice of prosciutto on if you can, it will complete this amazing creation). Stay Hungry Y’all! In a cast iron pot bring oil up to 375 degrees using a frying thermometer to gauge temperature. In a large bowl mix the buttermilk, hot sauce and smoked paprika plus a pinch of salt , add more hot sauce if tolerable . Then place the onion rings in the buttermilk to marinate. In a baking dish mix the flour, cornmeal, heavy hand of salt, tablespoon of pepper and 2 to 3 tablespoons of Cajun seasoning and stir to combine, then divide half into second dish. Prepare a wire cooling rack over a cookie sheet. Once oil is up to temperature, take an onion ring from the butter milk and dredge in flour pan #1 dust off excess flour and re-dip in buttermilk then dredge in flour pan #2 shake off excess flour and place on rack to rest while dredging other rings. 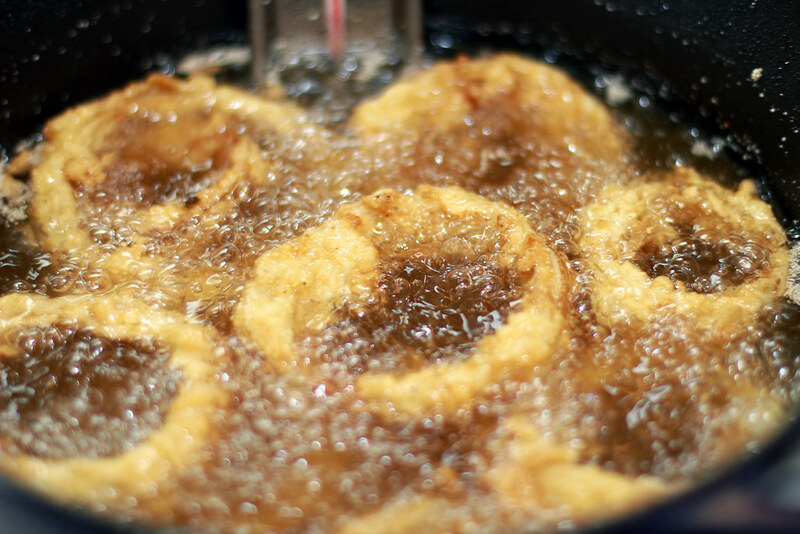 Then carefully place rested onion rings in the hot oil, turning frequently. It will take at least 4 minutes to fry, we are looking for the darkest color possible, without the rings burning, but almost. When the rings are done frying place on a plate with paper towels to catch excess oil and add salt and cajun seasoning immediately. Pick your crispiest rings and use on your sandwich. Enjoy! Sounds pretty tasty! 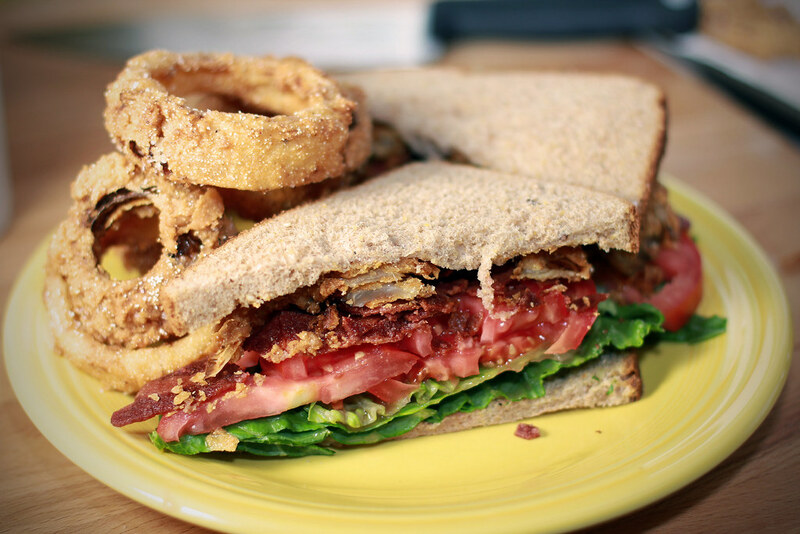 We like to make a BLAT….bacon, lettuce, avocado and tomato. It helps to kinda mash the avocado a bit so it doesn’t slide off the bread/toast. Yeah we love to add avocado to just about everything as well. They are so good deep fried too. YUM! I love to add onion rings to my burger. We’ll have to try them on a BLT next.